Many Europeans, Japanese and Americans feel better today about their nations’ economies than they did before the 2008 financial crisis, according to a new global survey by Pew Research Center. In most countries surveyed, perceptions of the economy broadly track actual performance – but that’s not always the case. We compared the public assessment of national economic conditions in 38 countries surveyed this spring with two common measures of economic health: real gross domestic product (GDP) per capita and unemployment. 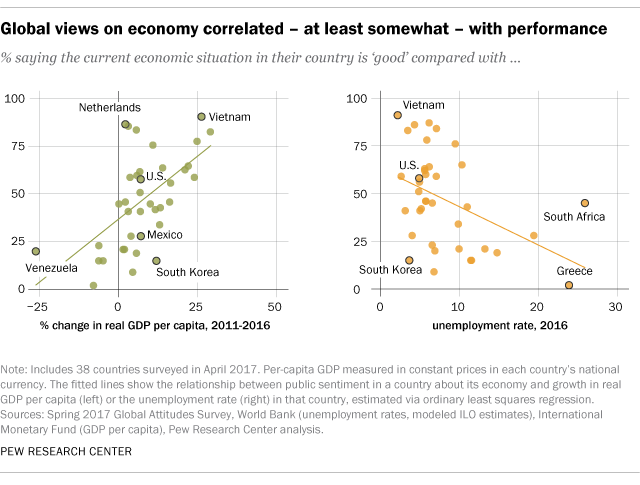 Our analysis found a modest relationship at best between those indicators and how people rated their nation’s economy, with plenty of outliers in both directions. For example, Greece and South Africa both had similarly high levels of unemployment in 2016: 23.9% and 25.9% respectively, according to modeled International Labour Organization estimates (which are weighted annual averages, harmonized to account for the different ways nations measure their own unemployment, and obtained from the World Bank). Yet 45% of South Africans termed their country’s economy good in the Center’s survey, compared with just 2% of Greeks. When examining per-capita GDP (measured in constant prices in each national currency, and obtained from the International Monetary Fund), we found the strongest association with public sentiment in the five-year change (2011-2016), compared with weaker correlations to one-year and 10-year changes. That suggests that when people are asked to gauge their nation’s economic health, they may be more influenced by recent history than by the very latest fluctuations or by longer-term trends. Vietnam had the most-positive public assessment of economic conditions – a whopping 91% of Vietnamese said their country’s economic situation was good. It also had the second-highest real per-capita GDP growth, up 26.3% from 2011 to 2016. In India, where real GDP per capita rose by 29.1% over the same five-year period, 83% of people called economic conditions good. On the other hand, Italy’s real GDP per capita fell 4.9% between 2011 and 2016; perhaps not surprisingly, only 15% of Italians called their nation’s economy good. But there were notable outliers too. In Venezuela, for example, 20% said the economy was good, even though the nation’s real GDP per capita fell 26.2% between 2011 and 2016 – by far the biggest drop among the countries surveyed. That was a bigger share than in South Korea, where only 15% called their country’s economy good. This was despite South Korea’s five-year growth rate in real per-capita GDP of 12%, well above the average (7.7%) for the 38 nations studied – not to mention a 3.7% unemployment rate that was among the lowest in the survey group. Conversely, 87% of people in the Netherlands called their country’s economy good, despite real GDP per-capita growth of just 2.2% over five years. Or consider the United States and Mexico. The two neighbors had identical growth rates for real GDP per capita in the 2011-16 period (7.1%). But their publics’ assessments of their respective economies were sharply different: More than half (58%) of Americans called the economy good, versus only 28% of Mexicans. Of course, economies are too complex to be summed up by one or two indicators, and people’s attitudes may be shaped as much, or more, by trends over time as by current conditions. For instance, although Greece and South Africa had similarly high levels of unemployment last year, Greece’s rate soared during the country’s debt crisis that began in 2009-10 – rising from less than 8% in 2008 to 27.5% in 2013. South Africa’s unemployment rate, by contrast, has been well above 20% for nearly its entire post-apartheid history. Also, there are many factors other than macroeconomic ones that can influence a person’s perception of his or her country’s economic health. These can range from the personal (how am I doing?) to the political (do I support or oppose the current government?) – and in some nations, the penal (will I get into trouble if I say the national economy is bad?). It also matters who you’re comparing your country with: Per-capita GDP in the U.S., for example, is about three times higher than it is in Mexico based on relative purchasing power. For example, a separate Pew Research Center survey conducted earlier this year found that Republicans’ views of current U.S. economic conditions and their outlook for the future improved markedly after Donald Trump’s election as president, while Democrats’ outlook – but not their current assessment – dropped off sharply. And South Korea and Brazil have been buffeted by waves of corporate and political scandals for the past several years, potentially contributing to their publics’ relatively low assessments of economic health.